Gul bara is a backgammon variant. It is also called as ‘Rosespring Backgammon’ or ‘Crazy Narde’. The motive of the game is to move all of one's checkers around the board and bear them off. The first player who bears off all his/her checkers wins the game. The game is popular in Bulgaria, Azerbaijan, Greece, Turkey and the Republic of Macedonia. Both players roll one die and the higher number goes first. That player rolls the dice again to begin his/her turn. Every player starts with fifteen checkers on the rightmost point of the far side of the board, at diagonally opposite corners from each other. They both move in the same direction, counterclockwise, around the board. A checker can only move to an open point, which is not occupied by the opponent's checker. The numbers on the two dice can be used by the player for either separate moves or he/she can add them together and use it for a single move. For example, if a player rolls 6 and 4, he/she may move one checker six spaces to an open point and another checker four spaces to an open point, or he/she may move the one checker a total of ten spaces to an open point, but only if the intermediate point (six or four spaces from the starting point) is also open. A major difference between Gul bara and other forms of backgammon is that there is no hitting in Gul bara. One checker placed at a point controls it, and a checker from the opponent cannot be placed at that particular point. An exceptional feature of Gul bara is that doubles are very powerful. In Gul bara when one rolls the doubles, the roll is played in the normal way and then every succeeding doubles is rolled up to and includes 6-6. 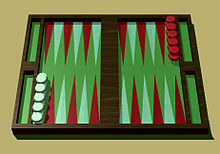 During the first three rolls of the game, doubles are played as in backgammon; each number is played twice. For example, a roll of 3-3 means one have four threes to use. The difference comes to the forefront when a player rolls doubles after the first three rolls. In this case the player not only plays the number he/she rolled four times, but he/she also plays each successive number four times. For example, if a player rolls 2-2, he/she can play four 2's, and then four 3's, and then four 4's, and then four 5's and then four 6’s. If at any point the player is unable to play all four numbers, he/she loses the remainder of his/her turn. And his/her opponent plays the remainder before his/her turn. It is not difficult to play consecutive doubles when the game is still in its early stages. But according to Gul bara rules it only takes one checker to block a point, so players block more points and as the game progresses playing all the doubles is often quite difficult. Bearing off can start once a player has moved all of his/her fifteen checkers into their home board. A player can bear off a checker by rolling a number that corresponds to the point on which it resides, then removing the checker from the board. If no checker is present on the point indicated by the roll, the player must make a legal move using a checker positioned on a higher-numbered point. If no checkers are present higher-numbered points, the player must remove a checker from the highest point that has a checker. The first player who bears off all his/her checkers gets one point and is declared the winner. The player who wins gets two points if he/she bears off all their checkers before the loser has borne off any.